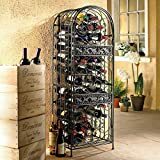 This cool new Gothic Wine Bottle Rack is a stunning wine storage rack / cabinet that is hand-forged from wrought iron and holds 42 bottles of your finest vintages behind latched doors. It even has a convenient top shelf for extra storage. 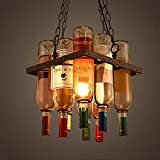 It's sure to make a dramatic addition to any proper wine cellar whether it be in a medieval castle or just your average home. Top shelf for extra special wine bottles!